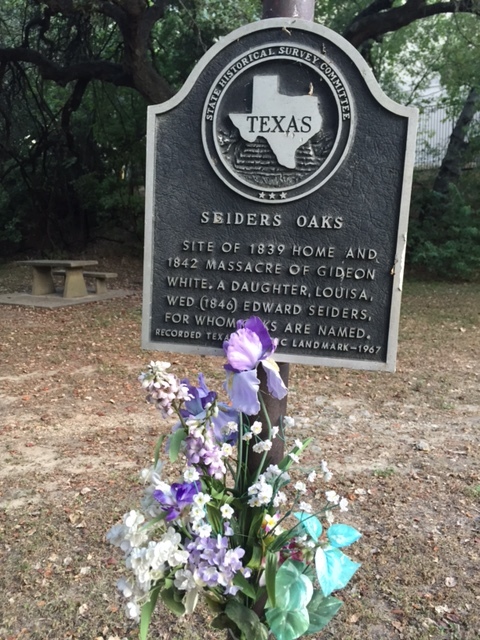 1842 was a fatal year for Gideon White. In that year, he was one of several people in the Austin area to he massacred by Indians. Originally from Alabama, he had moved his family in 1839 to the artesian springs near Shoal Creek, just outside the new capital of the Republic of Texas. White built a log cabin there and ignoring warnings about Indians, on Oct. 25th, 1842 he went looking for cattle, taking along a gun but not his horse. About a quarter mile west of the springs, White was overtaken by Indians (probably Comanches) and a terrific fight ensued. White killed one or two Indians before being killed himself. A large oak tree at the site bore sears of the battle for many years afterward. This was the first of many events to take place at Seiders (pronounced cedars) Springs. Located on the east bank of Shoal Creek between West 34th and West 35th streets, west of Lamar, the springs are a short walk from ourneighborhood. Four years after the fight. Ed Seiders, who was in the grocery and livery businesses, married Louisa Maria White, one of Gideon White’s daughters. For a time they lived at the springs that took their name, as did the oak grove along the creek. 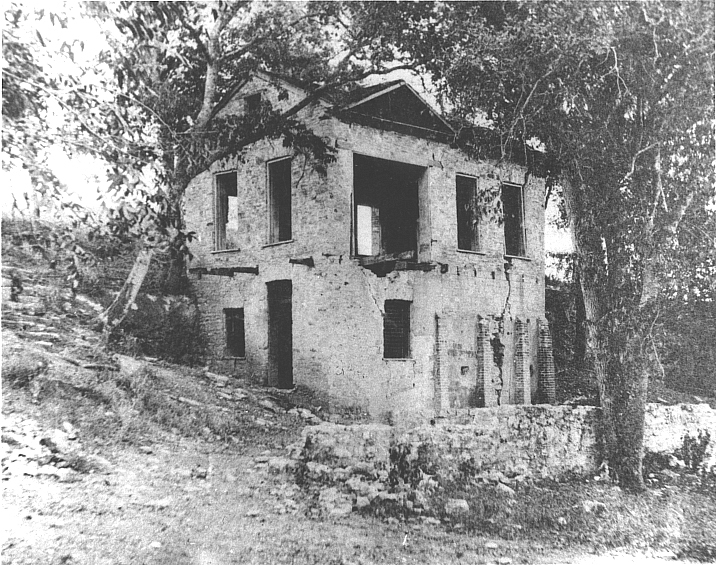 From 1847 to 1865 Fort Austin and other army forts used water from the springs. The old concrete bridge beside the West 34th Street bridge over Shoal Creek dates back to the 1850s, when it was part of the principal road leaving Austin to the west. General Robert F. Lee once camped near the springs and when an epidemic (probably cholera) broke out, his troops buried a number of men near Pease Park. In 1865, General George Armstrong Custer camped at the springs with his men on Glenn Ridge, probably where Shoal Creek Hospital stands today. He was military governor of Texas for a few months, and his relationship with the people of Austin can best be described as mutual admiration. He sincerely liked and admired the people of Texas, and they responded in kind. Custer wrote his family that “Texas is the real future of America,” and urged them to move here. The Texas Legislature was the only state legislature to send official condolences to Custer’s family after his death at Little Big Horn. 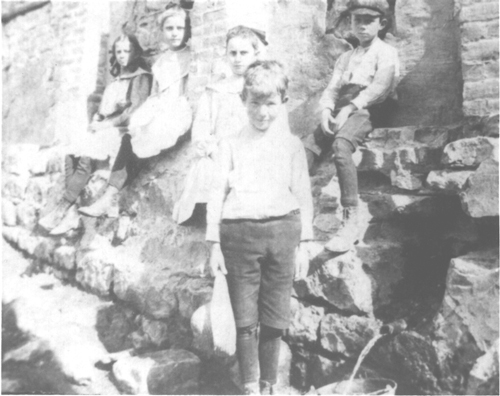 From 1871 to 1890, Seiders operated a pleasure resort and playground at the springs. Baths were cut out of the limestone slope, covered with bathhouses and filled from the springs. A special feature was an ambulance which ran daily to and from the Avenue Hotel in town. In 1890, Ed Seiders sold the springs to a New York developer who tried unsuccessfully to establish a subdivision there. He built a dam at tile springs called Alamo Dam and featured swans and picnic tables on the shores. The dam, along with the Colorado River dam, was destroyed in the flood of 1900.
re: ” The old concrete bridge beside the West 34th Street bridge over Shoal Creek dates back to the 1850s, when it was part of the principal road leaving Austin to the west” .. A great bit of history, and thank you for sharing. I do have a question, as I’ve been researching some old “routes” through Austin. 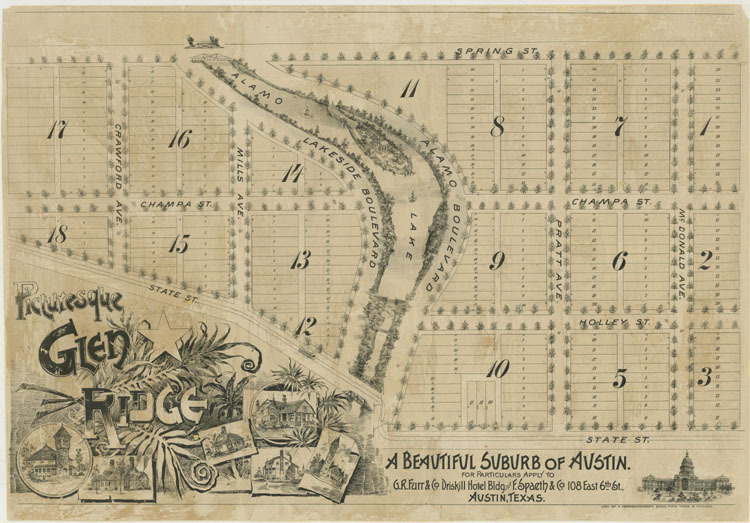 On the USGS map done of Austin ( Hill, Robert Thomas. Geologic Atlas of the United States: Austin Folio, Texas. Reston, VA: U.S. Geological Survey, 1902) the only bridge shown across Shoal Creek is north of Seiders Springs, i.e. 38th street. Can you point me to some background on “State Street” and its crossing here in 1850? Much appreciated ..